Siegl confronts McKinnn about his actions. Source: Facebook. 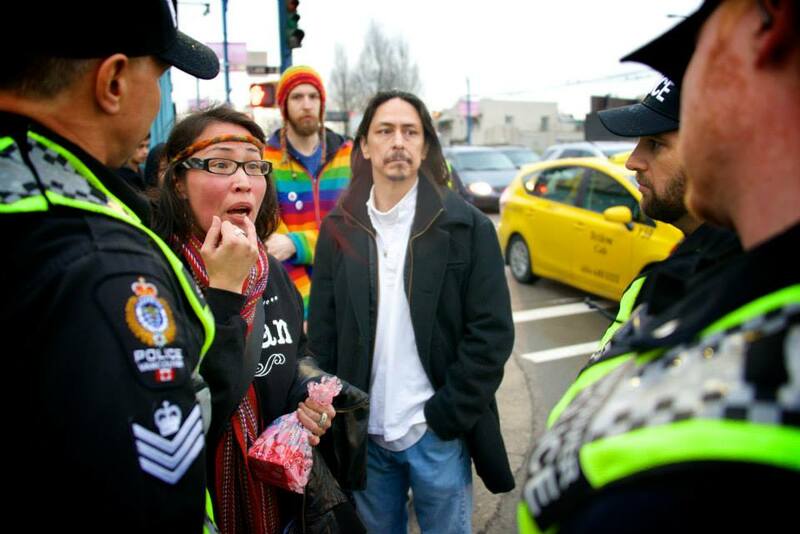 A prominent First Nations activist is claiming she was injured by an officer with the Vancouver Police Department. Audrey Siegl is a member of the Musqueam First Nation and a 2014 COPE candidate for city council who received more than 19,000 votes in last November’s civic election. In a telephone interview, she told the Straight she plans on filing a complaint and is speaking with lawyers about what additional legal options she might be able to pursue. According to Siegl, the incident occurred during a “Shutdown Canada” protest that was held the afternoon of Friday, February 13. She said she was standing with other demonstrators near the intersection of Clark Drive and East Hastings Street when, at approximately 4:15 p.m., a VPD officer stepped from behind a sawhorse barricade and began moving towards her. Siegl said the drum cut her lip and left a bruise. Photographs confirm those injuries did occur, and a video posted on Facebook shows Siegl in close contact with a VPD officer during the February 13 protest. In an email to the Straight, VPD Const. Brian Montague, a spokesperson for the force, emphasized that the VPD attends hundreds of protests every year without incident. Montague noted that there were four arrests made for breaches of the peace during the February 13 protest. He noted that Siegl was not one of those apprehended. In a subsequent interview, Montague said the VPD is “looking into” Siegl’s claims. “It is unfortunate if she was injured during the protest,” he added. Siegl went on to argue that after she was allegedly injured by the constable, that he and other officers monitoring the protest failed to take her complaints seriously. Speaking more generally, Siegl suggested that the incident fits into a pattern of marginalization that has allowed for so many indigenous women to go missing or be murdered in the Downtown Eastside. Posted on February 18, 2015, in State Security Forces and tagged #shutdowncanada, MMIW, native blockades, native protests, Public Safety Unit, Vancouver Police Department. Bookmark the permalink. 1 Comment. There has been a video circling around which clearly shows the rcmp officer walk up while In passing, shove his shoulder into her drum causing her drum into smack her face causing the injury to her lip. It showed the rcmp eyeing her before and during the incident. It was very distrubing to see a person in uniform act In such a hateful unproffessional manner. It made me so compelled that I In turned sent a copy of said video to Amnesty International Canada in hopes that they can do something about what was clearly a human rights violation. I do hope they log this incident with other past Incidents of human rights violations created by the rcmp’s that ha been placed upon the First Nations People of Canada. This proves world is watching!